American family that has been identified with both the general and the Jewish community of New York city since the latter half of the eighteenth century. The earliest member of the family (in America) was Simon Nathan. Son of Seixas Nathan; born in New York city 1813; died 1870. He was elected a member of the New York Stock Exchange in 1836, became its vice-president in 1851, and remained an active member until his death. For a number of years he was a director of the Chicago & Northwestern Railroad and of the Ninth Avenue Street Railway of New York; he was also a member of the first board of directors of the Jews' Hospital (now Mount Sinai Hospital) in 1852, its vice-president in 1855, and president from 1856 to 1870. In 1849 Benjamin Nathan was appointed aide-de-camp, with the title of colonel, to Governor Hamilton Fish of New York. He was a member of the Union and Union League clubs, of the St. Nicholas Society, and was president of the Shearith Israel congregation. Two sons of Benjamin Nathan, Harmon (b. 1843) and Frederick (b. 1844), were members of the Seventh Regiment, New York State Militia, which volunteered, in 1863, into the Union army; they served with the regiment during the riots in New York in July, 1863. Both Harmon (since 1864) and Frederick (since 1869) are members of the New York Stock Exchange; the latter has been a director of the Home for Aged and Infirm Hebrews for twenty-one years, and honorary secretary for over seven years. Lawyer; son of Jonathan Nathan; born in New York city in 1843; educated at Columbia College (B.A. 1861; M.A. 1864). He was admitted to the bar of New York in 1864, became assistant corporation counsel (1866-72), and is a member of the St. Nicholas Society. Lawyer; son of Seixas Nathan; born in New York city 1811; died 1863; educated at Columbia College, New York city (B.A. 1827). From 1840 to 1846 he held the position of master in chancery; he was associated for many years with Alexander W. Bradford, surrogate and lawyer in New York. Jonathan Nathan directed particular attention to equity and surrogate's practise, and was engaged in many noted cases, including the "Ross Will" case and the contest over the will of Commodore Uriah P. Levy; he was one of the commissioners of records who prepared the "Index of the Conveyances Recorded in the Office of Register of the City and County of New York" (published 1862); an active member of the Whig and later of the Republican party; one of the founders (1835) of the St. Nicholas Society; a member of the Column, Union, and Weda clubs and president of the Shearith Israel congregation. Daughter of Robert Weeks Nathan; born in New York Oct. 20, 1862; president of Consumers' League, New York, since 1897, with which she has been prominently identified since its organization in 1890; she is also vice-president of the National Consumers' League. 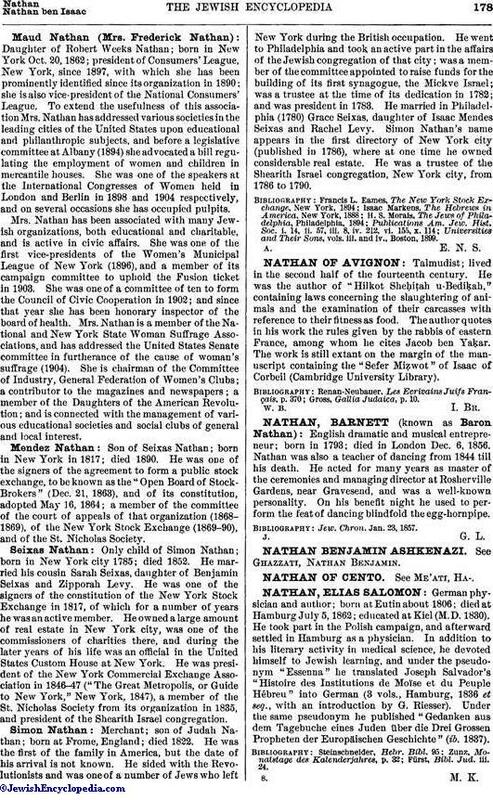 To extend the usefulness of this association Mrs. Nathan has addressed various societies in the leading cities of the United States upon educational and philanthropic subjects, and before a legislative committee at Albany (1894) she advocated a bill regulating the employment of women and children in mercantile houses. She was one of the speakers at the International Congresses of Women held in London and Berlin in 1898 and 1904 respectively, and on several occasions she has occupied pulpits. Mrs. Nathan has been associated with many Jewish organizations, both educational and charitable, and is active in civic affairs. She was one of the first vice-presidents of the Women's Municipal League of New York (1896), and a member of its campaign committee to uphold the Fusion ticket in 1903. She was one of a committee of ten to form the Council of Civic Cooperation in 1902; and since that year she has been honorary inspector of the board of health. Mrs. Nathan is a member of the National and New York State Woman Suffrage Associations, and has addressed the United States Senate committee in furtherance of the cause of woman's suffrage (1904). She is chairman of the Committee of Industry, General Federation of Women's Clubs; a contributor to the magazines and newspapers; a member of the Daughters of the American Revolution; and is connected with the management of various educational societies and social clubs of general and local interest. 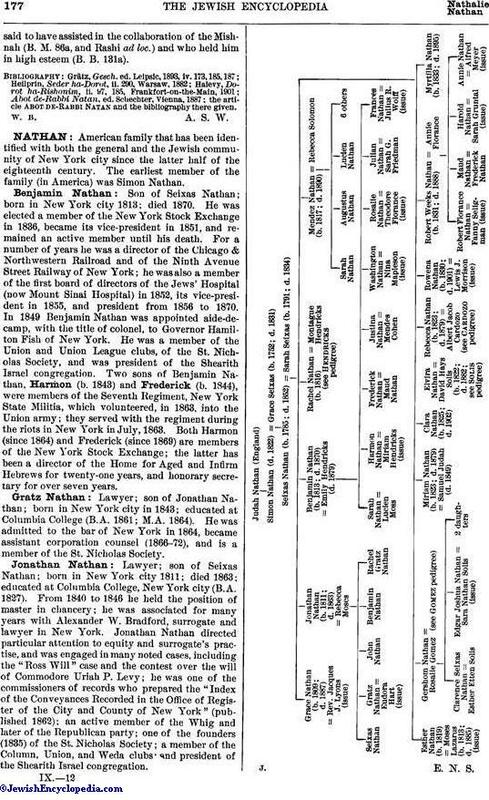 Son of Seixas Nathan; born in New York in 1817; died 1890. He was one of the signers of the agreement to form a public stock exchange, to be known as the "Open Board of Stock-Brokers" (Dec. 21, 1863), and of its constitution, adopted May 16, 1864; a member of the committee of the court of appeals of that organization (1868-1869), of the New York Stock Exchange (1869-90), and of the St. Nicholas Society. Only child of Simon Nathan; born in New York city 1785; died 1852. He married his cousin Sarah Seixas, daughter of Benjamin Seixas and Zipporah Levy. He was one of the signers of the constitution of the New York Stock Exchange in 1817, of which for a number of years he was an active member. He owned a large amount of real estate in New York city, was one of the commissioners of charities there, and during the later years of his life was an official in the United States Custom House at New York. He was president of the New York Commercial Exchange Association in 1846-47 ("The Great Metropolis, or Guide to New York," New York, 1847), a member of the St. Nicholas Society from its organization in 1835, and president of the Shearith Israel congregation. Merchant; son of Judah Nathan; born at Frome, England; died 1822. He was the first of the family in America, but the date of his arrival is not known. He sided with the Revolutionists and was one of a number of Jews who left New York during the British occupation. He went to Philadelphia and took an active part in the affairs of the Jewish congregation of that city; was a member of the committee appointed to raise funds for the building of its first synagogue, the Mickve Israel; was a trustee at the time of its dedication in 1782; and was president in 1783. He married in Philadelphia (1780) Grace Seixas, daughter of Isaac Mendes Seixas and Rachel Levy. Simon Nathan's name appears in the first directory of New York city (published in 1786), where at one time he owned considerable real estate. He was a trustee of the Shearith Israel congregation, New York city, from 1786 to 1790. Universities and Their Sons, vols. iii. and iv., Boston, 1899.